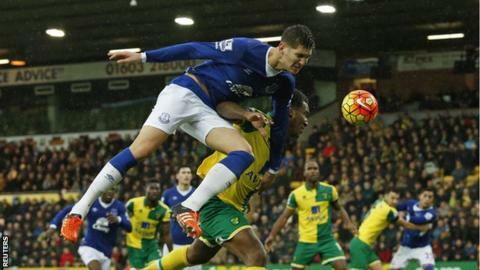 Norwich produced a battling second half display to hold Everton to their third straight Premier League draw. Toffees striker Romelu Lukaku scored for the sixth successive league game with a header from Gerard Deulofeu's excellent cross. Leighton Baines was denied by the woodwork, while Arouna Kone and Lukaku also missed chances for Everton. Wes Hoolahan levelled for Norwich from close range before Cameron Jerome missed a great chance for the hosts. Lukaku now has 15 league and cup goals this season, seven in his last six league games and is second in the Premier League's top scorers with 12 behind Leicester's Jamie Vardy (14). His header from Deulofeu's floated delivery displayed everything that is good about the Belgium striker. But Lukaku went on to spurn a host of chances as Everton failed to add to their early lead despite dominating a Norwich side that looked desperately short of confidence before the interval. Baines was denied a goal on his first league start of the season while Kone was also guilty of wasting a couple of chances before Norwich came back strongly after the break. While Everton remain unbeaten in six league games, improvements are required if they are to seriously push for a European place. Norwich, who conceded early on, went into the match with just one clean sheet in 15 league games. But Everton's failure to extend their lead allowed the hosts a point that looked beyond them during a one-sided first half. Neil responded at the start of the second half by replacing Andre Wisdom with Ryan Bennett and it was a change that produced an instant response as Hoolahan bundled Bennett's header over the line. Norwich went for the winner in this entertaining match but their finishing was as bad as Everton's - Jerome somehow squandering an excellent chance from eight yards. Norwich manager Alex Neil: "If we perform like we did in the second half then we will be fine. "We had a good discussion in terms of what's acceptable and all the questions I posed to them at half-time they came out and answered. "Tactically nothing changed. All that changed in the second half was the way we went about our business." Everton manager Roberto Martinez: "Football can be cruel at times and it was today. There is considerable frustration when you create so many chances and you don't get the second goal. "You end up having something to lose. Norwich could have been out of the game at half-time but we gave them a little bit of hope. "Then the belief and momentum goes into them with the goal." Romelu Lukaku became the first Everton player to score in six successive Premier League games (beating Duncan Ferguson's record of five). Lukaku is the first Everton player to score in seven successive games in all competitions since Bob Latchford in December 1975. Gerard Deulofeu has assisted six goals for Romelu Lukaku this season in the Premier League - no player has assisted as many goals for a single player in the Premier League this season. Norwich City have won just one of the last 11 Premier League meetings with Everton (W1 D6 L4). Norwich now face back-to-back away games at Manchester United (19 December) and Tottenham (26 December) before their next Carrow Road appearance. Martinez and his Everton players have a full week to work on killing teams off before leaders Leicester City visit Goodison Park on 19 December. Match ends, Norwich City 1, Everton 1. Second Half ends, Norwich City 1, Everton 1. Attempt blocked. Kevin Mirallas (Everton) right footed shot from the left side of the box is blocked. Russell Martin (Norwich City) is shown the yellow card for a bad foul. Attempt missed. Darron Gibson (Everton) right footed shot from outside the box is too high. Assisted by Kevin Mirallas. Attempt missed. Jonny Howson (Norwich City) right footed shot from outside the box is just a bit too high. Assisted by Cameron Jerome. Substitution, Norwich City. Jonny Howson replaces Wes Hoolahan. Attempt missed. Ramiro Funes Mori (Everton) right footed shot from outside the box is too high. Attempt missed. Gareth Barry (Everton) header from the centre of the box misses to the right. Assisted by Leighton Baines with a cross following a corner. Attempt saved. Gareth Barry (Everton) left footed shot from the centre of the box is saved in the centre of the goal. Assisted by Arouna Koné. Attempt missed. Alexander Tettey (Norwich City) right footed shot from outside the box misses to the right. Assisted by Gary O'Neil. Attempt missed. Cameron Jerome (Norwich City) right footed shot from the centre of the box is too high. Assisted by Wes Hoolahan. Attempt missed. Seamus Coleman (Everton) left footed shot from outside the box misses to the right. Attempt blocked. Arouna Koné (Everton) right footed shot from the centre of the box is blocked. Assisted by Romelu Lukaku. Attempt blocked. Wes Hoolahan (Norwich City) left footed shot from the left side of the six yard box is blocked. Gerard Deulofeu (Everton) wins a free kick on the right wing. Attempt missed. Tom Cleverley (Everton) right footed shot from the centre of the box is high and wide to the right.